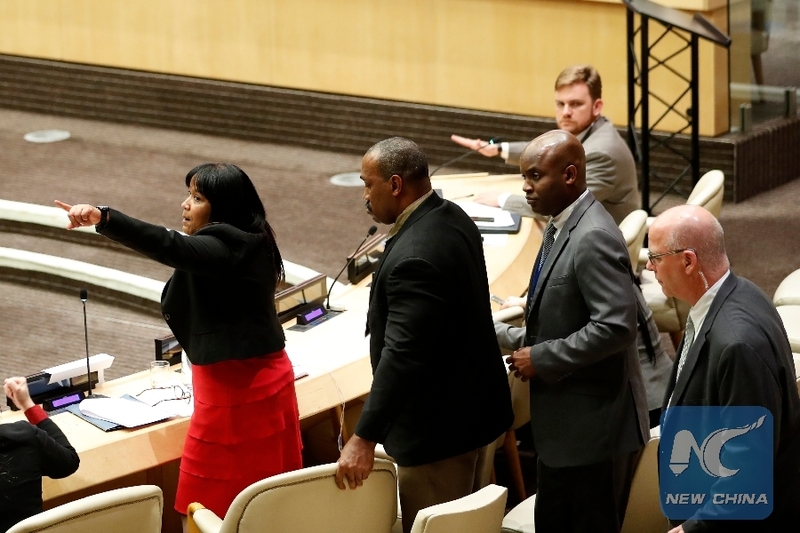 UNITED NATIONS, Oct. 23 (Xinhua) -- Cuba on Tuesday criticized the United States for its unpaid dues to the United Nations. "It is alarming that the largest debts to the United Nations are concentrated in the hands of one country, the United States," said Anayansi Rodriguez Camejo, Cuba's permanent representative to the UN. While noting that the United States insists on reminding other member states of its status as the main contributor, she said that Washington in fact owes more than 1.625 billion U.S. dollars, or 58 percent of total assessments, including more than 800 million dollars to UN's peacekeeping budget. "The United States' main purpose for withholding payments -- and in particular for paying into the regular budget at the end of the year -- is to subject the organization to financial blackmail," she said at a meeting of the Fifth Committee (Administrative and Budgetary), which debated the financial situation of the UN. The Cuban ambassador also criticized the United States over its business-oriented mentality in dealing with the world body. "It is also alarming that the same country talks about getting better returns on its investment in the organization. This shows that it considers international peace, development and human rights a business," she said. The Cuban ambassador went on to say that Cuba is proud to be among those countries that have fulfilled their financial obligations, despite an economic, commercial and financial blockade imposed by the United States for 56 years. A U.S. representative responded to the criticism, asserting that her country remains committed to the organization and "is fully meeting its financial commitments," albeit later in the year than other member states. Emphasizing that her government takes its international obligations very seriously, Cherith Norman Chalet, U.S. ambassador for UN Management and Reform and Alternative Representative to the General Assembly, said the amount reflected by the UN as owed by the United States is "distorted" because of differences in the U.S. and UN fiscal years, among other factors. The discussion came a week after Jan Beagle, under-secretary-general for management, informed the committee that the organization's cash position remains "precarious," with deficits becoming larger and arising earlier in the year. Some 145 member states have now paid their regular budgets in full, while 55 have met all their financial obligations for peacekeeping, according to the UN official.